‘Suddenly the air was filled with orange smoke, and a hail of bricks, bottles and pieces of wood fell onto the Front from demonstrators and householders leaning out of their windows… At one point the Front marchers stopped. Half the marchers remained in Pagnell Street, afraid to walk into the hail of missiles… One young man, perhaps 16 years old, rushed into the Front ranks and grabbed a flagpole from one of them, broke it in half and held the pieces up while the crowd cheered. Others hurled dustbins and fence stakes into the Front column from close range’ (Kentish Mercury 18.8.77). In later clashes in Lewisham town centre, police used riot shields for the first time in England as they confronted anti-fascists and local young people. This year the 40th anniversary of what has become known as the ‘Battle of Lewisham’ was marked with a series of events in the local area initiated by the History department at the nearby Goldsmiths University. There were film shows, history walks, gigs, a photography exhibition and the unveiling of a plaque on Clifton Rise where anti-fascists gathered in 1977. 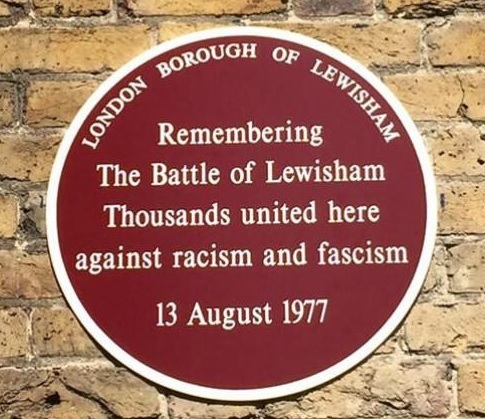 The plaque read ‘Remembering the Battle of Lewisham – thousands united here against racism and fascism’. Ten years ago a similar series of commemorations was held to mark the 30th anniversary – clearly Lewisham ‘77 is not going to be forgotten, and many people in this part of London are rightly proud of its historical significance. Its contemporary relevance is clear enough, with the far right resurgent in many parts of Europe and North America. In fact the unveiling of the plaque on 13 August 2017 took place on the same weekend as the white supremacist rally in Charlottesvillle, USA, and the murdered anti-fascist Heather Heyer was mentioned in the New Cross speeches. Days like these should be remembered and can inspire us in the present. If people like us could inflict a defeat on fascists in 1977, we can do the same again. But contemplating seemingly unconditionally successful mass movements in history can also be demotivating. Measuring ourselves against the imagined actions of our semi-mythical ancestors, we can end up agonising about not being able to match their numbers let alone their deeds, lost in a daze of radical nostalgia for when times were apparently simpler and victories easier to grasp. If we are not to be permanently disillusioned, we do need to think critically about the past and try to understand as far as we are able what really happened rather than settle for over-simplified myths. In the case of Lewisham in 1977, there have certainly been some of the latter. While the anti-fascists clearly had the upper hand in the Battle of Lewisham, the extent of their success can be exaggerated. A common myth is that the National Front were prevented from marching that day. Socialist Worker declared in the immediate aftermath ‘They did not pass! The Nazis remained in the back street cowering behind massive police lines until they were finally forced to abandon their march before it was half completed’ (27 August 1977). It is certainly true that the NF’s plans for a triumphant show of strength were fatally undermined, with the march starting in a chaotic shambles. But the demo was not entirely abandoned. Eventually, police, including some on horses, managed to clear a path for the bedraggled NF contingent to continue on its way through deserted streets with the opposition held back by police road blocks. Instead of a victorious mass rally in the town centre, their day finished with speeches in a car park. The NF did, however, make it to Lewisham, a testament not to their strength but to the determination of the police to allow them to march. While the National Front were no more successful over the next few years in mobilising big numbers on the streets, they were not vanquished after Lewisham either. In fact, in April 1980 several hundred NF supporters staged another march in the area, heading from Forest Hill to Catford. As in 1977, they were protected by thousands of police who launched violent attacks on anti-fascist counter-demonstrators. A month before, on 2 March 1980, around 1000 people took part in an NF demo in nearby Peckham with racists chanting ‘the National Front is the white man’s Front, join the National Front’. By this point though the NF’s active support was identified primarily with young racist skinheads, and it is arguable that the association of its events with violence, as at Lewisham, did discourage a wider range of people from getting involved. It is important to recognise that the NF did have some support in this period, even if this did not translate into a mass street presence. It is another myth that the entire community, black and white, came together to oppose the National Front in South East London in 1977. Accounts from the time and photographic evidence do show that there was an impressively diverse crowd in New Cross, made up of locals and others who travelled from across the country to be there. But the NF had chosen to march in that area precisely because it hoped to capitalise on simmering racism amongst some local white people. In a 1976 Deptford council by-election the National Front and its splinter National Party had achieved a combined vote of 44.5%. In the following year’s Greater London Council elections their combined vote in Deptford may have been only 14%, but part of the context of the Battle of Lewisham was that the NF was looking to regain momentum in that area. Then as now, treating fascism as some kind of alien virus risks ignoring the swamps of everyday racism where it can grow, including in working class communities. In the past few months, much of the debate about anti-fascism in the USA in particular has become polarised around the question of the role of violence. In Lewisham in 1977 there were similar arguments, and this is sometimes presented as being primarily a dispute between the Socialist Workers Party, who advocated attempting to physically prevent the NF from marching, and the Labour Party and Communist Party, who tried to persuade the Government to ban the march and then, having failed to do so, encouraged people to demonstrate in a different part of Lewisham and avoid confrontation. It would surely be rewriting history to ignore the significant role of the SWP in Lewisham; they did argue strongly from the start that anti-fascists should meet in New Cross and attempt to prevent the NF from marching, and they established an ‘August 13 Ad Hoc Organising Committee’ to put this into effect. On the day they mobilised their supporters effectively, but a range of other radical groups did likewise with a similar perspective. Photos from the time, for instance, show banners from Socialist Challenge (paper of the International Marxist Group) and the Anarchist Black Cross in New Cross Road, as well as Darcus Howe of the radical black Race Today Collective. The other main mobilisation was the march organised by the All Lewisham Campaign Against Racism and Fascism (ALCARAF), which did start some distance away and included local political and religious leaders. It would be a mistake, however, to see this as simply a liberal diversion from militant anti-fascism. ALCARAF was affiliated to the All London Anti-Racist Anti-Fascist Co-ordinating Committee (ARAFCC), made up of locally-based groups, (another was SCARF – Southwark Campaign Against Racism and Fascism), some of which were very militant. The ALCARAF march did provide space for those who wanted to demonstrate peacefully, but many within were determined to move on to New Cross afterwards to confront the NF. The route of the march was planned to finish near the NF meeting point in New Cross but, as expected, the police blocked it. However, ARAFCC had planned in advance for this and its stewards helped guide most of the march around police lines and on to New Cross. One group associated with ARAFCC, Women Against Racism and Fascism, mobilised one of the largest contingents on the day. As Jenny Bourne recalls, ‘hundreds of us… met up at London Bridge to take the train to Ladywell. I remember the atmosphere – slightly nervous, slightly hysterical, lots of bravado and showing off as to who was wearing the hardest boots’. After taking part in the ALCARAF march, they headed to New Cross where the WARF contingent sat down in the main road to block the planned NF route – they were attacked by ‘mounted police, who from horseback, with long batons drawn, rained down blows on head after head – scattering us, beating us as they went, drawing blood and creating mayhem’. So in Lewisham there was a range of different approaches to taking direct action against the fascists, and to making alliances, that cannot be reduced to a simple for or against violence equation. And of course many people who attended did not mobilise on the basis of a particular political line but responded to events as they unfolded. This included local black youth who were on the streets in large numbers in Lewisham town centre. For them, everyday racism at the hands of the police was as much an issue as fascist attacks and they took the opportunity to express their anger against them. Even within the ranks of the SWP there were emerging differences about tactics. The party had initially encouraged the development of anti-fascist squads to defend meetings and paper sales against fascist attack, and these were in action in August 1977. In Manchester, a coach carrying NF supporters was attacked before it even set off to London. But in the aftermath of Lewisham, as the SWP prioritised the development of the broader Anti Nazi League with its Labour MPs and celebrity supporters, such activity was downgraded. Some of those who advocated it were to be expelled and denounced as ‘squaddists’ in 1981/2. This was the origin of the group Red Action who in turn played a key role in the foundation of Anti Fascist Action, carrying forward the militant anti-fascist approach into the 1990s. 13 August 1977 became known as the ‘Battle of Lewisham’ more or less immediately – it was described as thus in both The Guardian and the Daily Mail in the following week – but the notion of a Battle arguably does not do it justice. It implies a military encounter between two armies, with their generals and foot soldiers, not to mention their attendant mythologies of blood, heroism and glory. Physical fighting was a significant aspect of the day, but it was not the only one, and those taking part in it did so with various perspectives. While the Leninist/democratic centralist myth holds that movements are most effective when everybody moves in the same direction under one leadership it could equally be argued that what lifts days like Lewisham ‘77 above the usual routine demonstration is that they involve large numbers following different approaches which have a combined effect greater than the sum of their parts. The point of subjecting events like these to historical scrutiny, and to a certain extent demystifying them, is not to diminish their importance or indulge in revisionist contrarianism. It is to recognise that in the past, as in the present, those resisting fascism have had to deal with contradictions, partial victories, and setbacks. The ‘Battle of Lewisham’ dealt a blow to the prestige of the National Front, and deserves to be commemorated as such, but it could not have vanquished the far right and it did not vanquish it. In different ways that battle has to be constantly refought. Fighting racism and fascism in 1977 was complicated! It still is.